This will be no ordinary camping holiday. It will be the classic Kiwi style with a touch of the bizarre thrown in for good measure. For where else does one go camping with a full size washing machine, a microwave oven, a wheat grinder for flour and a gas califont for hot showers? As we have two Land Rovers, one with a huge roof rack, and a trailer, we can take lots of useful things, most importantly a 3,000 watt (230 volt) power generator. This will run much of our equipment... like battery chargers, computers, radios and cooking apparatus. Food will be cooked on a gas stove, but if anything breaks down, or we need to conserve gas, and providing there is no fire restrictions in force, the good old camp fire will only be a match away! Fish, namely Trout, or land-locked Salmon, can be caught from the river nearby. We are taking Fly Fishing gear to do this. Meat is waiting in the adjacent hills... Rabbits, Hares, Deer and maybe even Goats! We're carrying an old .303 British Army Rifle in the hope that we can catch something to take away the boredom of tinned Spam or Corned Beef! Bread or pancakes can be freshly made each day from whole wheat, ground as required in a portable grain mill. Mixed with yeast and other necessary ingredients it will give us the energy to clamber the mountains from daylight to dark! Sacks of Potatoes, bags of Onions, boxes of packet milk, and lots and lots of various tinned food will help us to get through our long stay in the Mountains without starving! For the past 6 months or so we have spent our time restoring a LWB (Long Wheel Base) Series 2a Land Rover, and making it suitable for the demanding task ahead of us. It has undergone a ground up restoration. A total strip down rebuild. 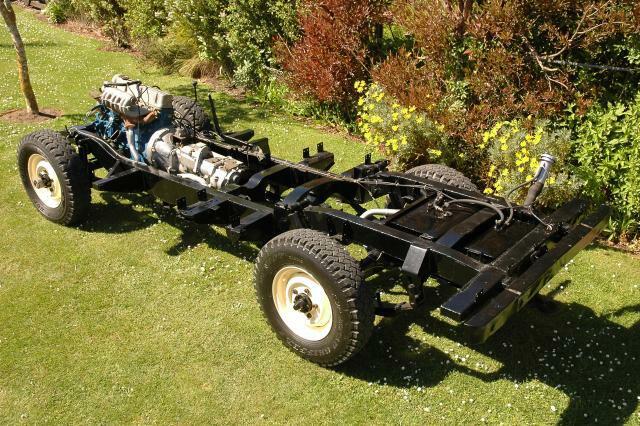 The body was removed and the chassis stripped and restored. The body was refitted using parts from various Land Rovers to get the perfect vehicle. 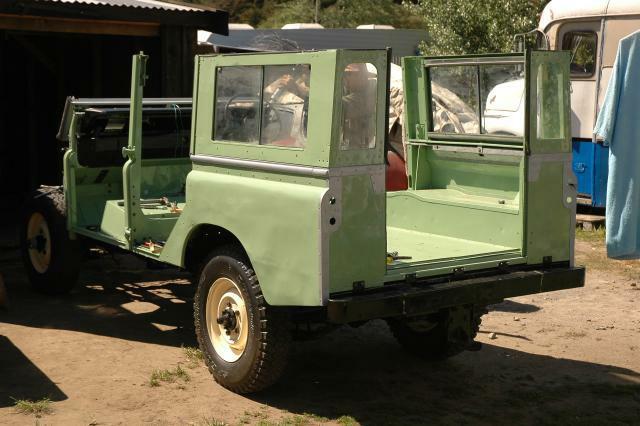 It is fitted with a Nissan LD28, 6 cylinder diesel engine on a standard Land Rover Series 2a gearbox. The high ratio diffs are from a Land Rover 90, and we have fitted a Fairey Overdrive. This means the vehicle can motor along on the open road at 60 mph (100kph) in comfort. 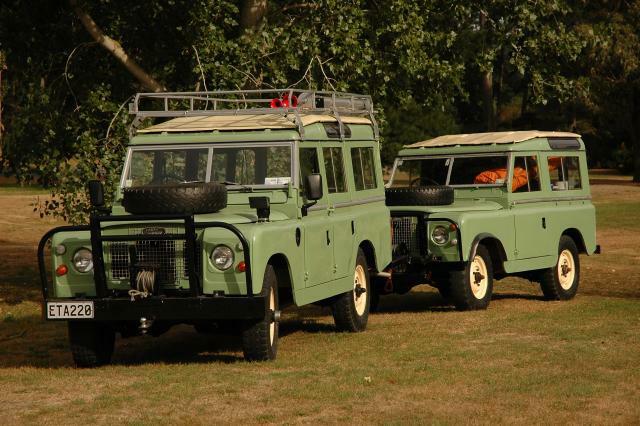 The SWB (Short Wheel Base) Land Rover is a Series 2a model as well. We restored that a couple of years back, but have recently given it a matching coat of paint! What are we going to do first? Well, first of all we plan to drive down to the nearest big town and stock up with fuel. We need so much fuel we think it would be wiser to purchase it closer to our destination to prevent a fire hazard on the way. We went to the Supermarket the other day and spent just over $950NZD on supplies... the teller people were astounded to see us with 3 trolleys loaded to the brim with all kinds of goodies! It is the biggest Supermarket bill we've ever had in our lives. Although at this stage we have no real time limit to be searching, we have set a 4 week limit. Everything we buy is to last 4 weeks. So we bought 40 packets of Milk... one for each day, plus a couple of extras! We may come out earlier for one of many reasons, but at least we'll have supplies for a maximum stay of 4 to 6 weeks. We have also purchased four 10 KG bags of Potatoes, a 25 KG sack of Onions, some fresh Dutch Cheese and a 50 KG sack of Conquest Wheat to make bread or pancakes etc from. Once we arrive at our destination, we're going to pitch our tents (2 large twelve man tents, a shower tent and a toilet tent and a large Gazebo for the vehicles in times of heavy rain), set-up camp then sit back and survey the area, and plan the next move. This next move is most important. We shall decide on the area to cover on foot, then mark it out on the GPS (connected to the laptop computer) to measure the proposed search spot. After we have decided on the area to cover we shall enter the bush, each abreast of the other and in a line move across the hillside. The searcher in the lowest position will carry a portable GPS, and so will the uphill person. The other searchers will be at positions in between the two people carrying the GPS units. In the evenings we will be able to put both tracks into the Laptop to find out the area covered that day. On our return I will post an update with photos to show our progress to date. I'll also add screen shots to show how the GPS systems work. Although this sounds a light hearted story, one which is full of of mystery, suspense, drama, there lingers with us a sorrow for those lost in the plane crash. It cannot be taken away, or made easy. We quite understand that for the grieving relatives this is not an exciting adventure, nor a fun camping holiday. This search could signal the end of almost 50 years of heartache. If we are successful in locating the missing 'plane, we trust it will bring peace to those unhappy families to be able to move their loved ones from an unknown mountain tomb to a grave where they know they are! The clock has struck... now is the hour... Operation Dragonfly is under way!